A new mobile phone that is suitable for blind users has been launched by the London-based OwnFone company. 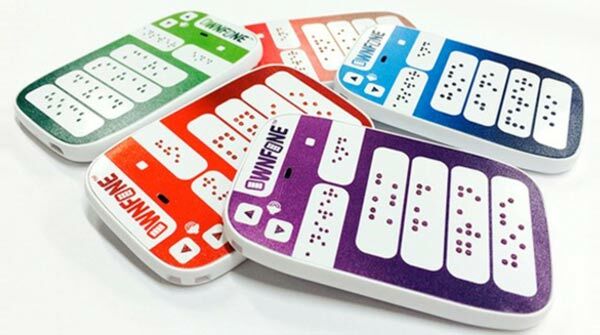 Previously OwnFone made available customisable feature phones aimed at young and old customers, now it has expanded the range with this quick-access Braille mobile phone model. The core OwnFone mobile is a small rounded rectangular handset with the entire front capable of being overlayed with a specially printed number of hot-keys to do quick access telephoning. For example you could choose to have just a couple of contacts printed on the front and you press these names to quickly call them. As well as this customisable region there are easy access volume controls and controls to answer and end a call. The Gadget Show reports that while your ‘regular’ 2D printed customisable surface OwnFone costs between £40 and £50 depending upon the options you choose a Braille version will be at least £60. Overall for such a useful communication device it might be acceptable to you. However I remember having a Motorola Timeport back in the early 200s which could dial friends by voice request – so perhaps there’s some cheap ‘candy bar’ feature phones that also have that functionality around today too. Do readers think this is a great innovation or a useless product? Let us know!